If you are allowed to create a group, you see the Create group button on the My groups overview page. Open: Check this box if you want to create an open membership group. 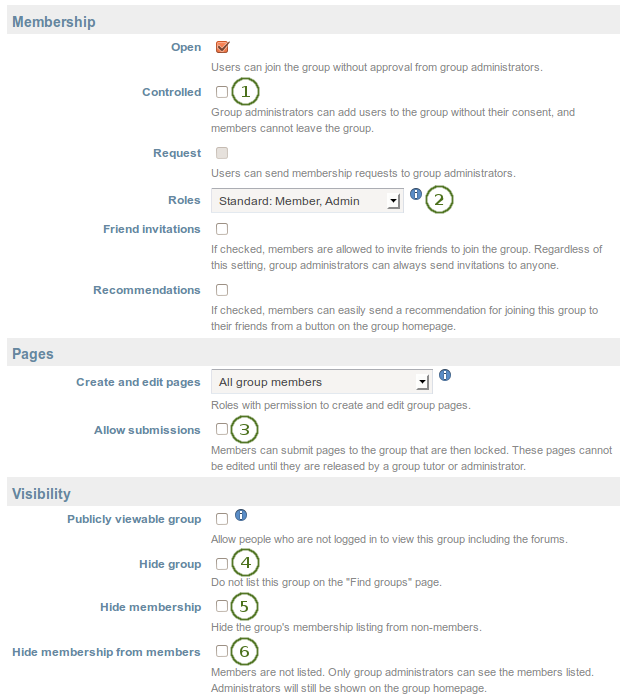 This allows users to join the group without approval from group administrators. Request: Check this box if you wish to create a request membership group. Users will have to send a membership request that requires group administrator approval. Open and request membership groups are mutually exclusive. Friend invitations: Check this box if you want to allow group members to invite friends to join the group. Regardless of this setting, group administrators can always send invitations to anyone. If the friends accept, they will be added automatically to the group. Recommendations: Check this box if you want to allow members to send a recommendation for joining this group to their friends from a button on the group homepage. If a request membership group has been recommended and the friends are interested in it, they would still need the approval of the group administrator to join. Friend invitations and recommendations are mutually exclusive options. Publicly viewable group: Choose this option if anybody shall have access to this group. You only see this setting if the site administrator allowed you to have it. Anybody online can see the group homepage and the discussion forum(s). Depending on the membership visibility, they may also see group members. Only members of the groups can see the group’s pages, unless they have been made public, and the files area. Participation report: Tick this checkbox if you as group administrator want to view a report displaying all group pages and those that have been shared with the group and see who commented on them. Start date: As group administrator you can decide when regular group members shall be able to create and edit content, forum discussions, pages and collections in the group. Tick the checkbox Set date to enter a date and time from when editing is allowed. Group administrators can always edit content in a group. 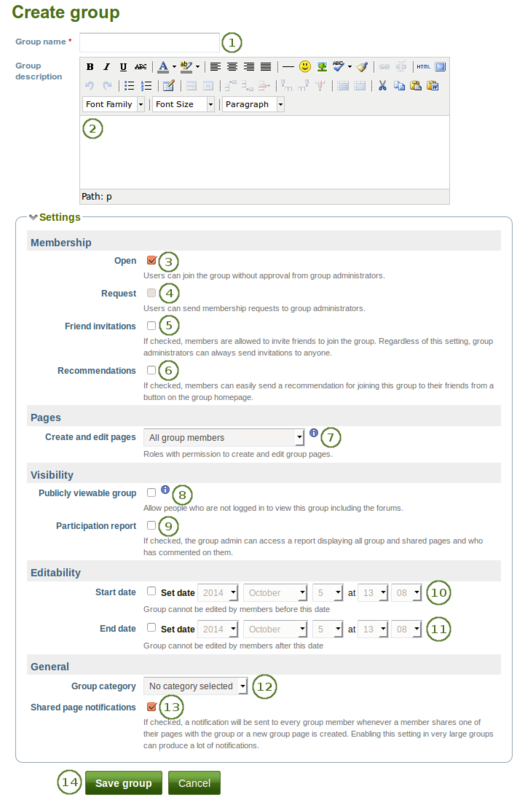 End date: You can allow the editing of group content for regular members up to a certain time. After that they will only be able to view forum discussions, pages, collections and files, but not edit them. Tick the checkbox Set date to enter a date and time until when editing is allowed. Group administrators can always edit content in a group. Group category: Choose a category if you want to associate your group to one, allowing you to filter groups on the My groups and Find groups page more easily. This setting is only available if the site administrator turned it on. Shared page notification: This checkbox has a check mark per default. Whenever somebody shares a page with the group, all group members, except the author of the page, receive a notification. A notification will also be sent when a new group page is created. You may want to uncheck this setting in very large groups where lots of pages are shared but members do not have to be notified. Click the Save group button to finish creating your group, or click the Cancel button to abort the group creation process. 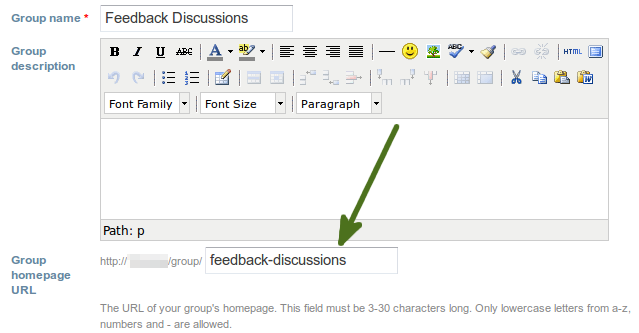 Allow submissions: Use this option to allow group members to submit pages or collections for feedback / assessment. These pages and collections as well as a number of content items in them are locked until released by a group administrator or tutor. Hide group: Use this option to not list this group on the Find groups page. Hide membership: Use this option to hide the group’s membership listing from non-members. Hide membership from members: Use this option to hide the group’s membership listing from members as well. Only group administrators can see the members listed. Administrators are still shown on the group homepage. When you have site administrator rights, you have yet another setting when you create a group: Auto-add users. When you tick this checkbox, new users to the site are added to the group automatically. This is a great setting when you want to set up a group which all users should join in order to participate in forum discussions etc. On mahara.org this is used to make every user a member of the “Community” group in which discussions around Mahara take place. You can change the group type to a different one. Please be careful if you do so especially when you have allowed submissions of pages and collections to the group. If users have submitted portfolio pages or collections to that group, they remain locked when you untick the setting Allow submissions, and you cannot release the pages until you enable that setting again. If the site administrator activated clean URLs, your group (homepage) has a human-readable URL which you can change to a certain extend. Choose the name for your group (homepage) if you do not like the default one. It must be 3-30 characters long. You can only use lowercase letters from a-z, numbers and - (hyphen). Your group will then be available via a URL like http://sitename/group/name-of-the-group, for example: http://mahara-university.org/group/portfolio-task-force. The original, internal Mahara URL, e.g. http://mahara-university.org/group/view.php?id=456 will still work.